PS: In the recent Brisbane floods, the RSPCA animal shelter at Fairfield went under & was severely damaged. They are exempt from disaster relief offered to charities assisting human needs. Please click here to donate towards their vitally important rebuilding process. And for donations to help human kind, please click here. Thank you for any help you can give ~ every dollar is gratefully appreciated! I think humanity gained 10 pounds the day they invented sweatpants. This picture is just lovely. Thinking about you often. Once everything gets put back into place, you deserve to go out and find this cafe. I think humility is gained every time I look at your talent on display here. This 1 is a 10 in my books! This picture make me wish I could just take out my colors, my pens & pencisl, brushes, and do something like this! Instead, I'll just send you my fotos of these cafes. I've lived place de la Contrescarpe during 5 years and I often had a coffee there. 25 years ago, it was one of the last "bougnats" of Paris ! A bougnat was, first the man,usually an "auvergnat" (from the Massif Central), then the place where you could get coal and/or wood and have a drink. The husband was delivering coal whereas the wife was serving the wine !! So, 25 years ago, you could see bags of coal and bundles of firewood where are the tables and chairs now. Thanks to Virginia for the picture and to you for the great interpretation. Absolutely lovely, but why are those chairs empty? Can't you see me sitting there having scones and tea? I might be taking up two chairs since I also cleared a whole tray of maccarons. Thank you for always bringing us such beauty, Shell. Even floods can't prevent you from creating sunshine. Such a quaint, inviting scene, Shell. It would be divine to sit in the sunshine and partake of a glass of wine or two with all of you. Perhaps one day . . . I've already got my stretchy pants on, Shell. Aww, thanks, dear Cafe. I'm just lucky ~ fingers are much easier to work with than paws. Marylène ~ that's a wonderful story! Thank you so much for explaining the history of this charming little spot. Alexa ~ what's been achieved all over the place here in a week is nothing short of awesome. As for your Paris trip ~ oooh, how exciting ~ thank you! I'll be looking forward to them. PCN ~ I cannot imagine you taking up two chairs. Not even after a tower of macarons, let alone a single tray. Ms M ~ yes, there's no such thing as Standing Room Only here. Such a lovely illo, Shell. 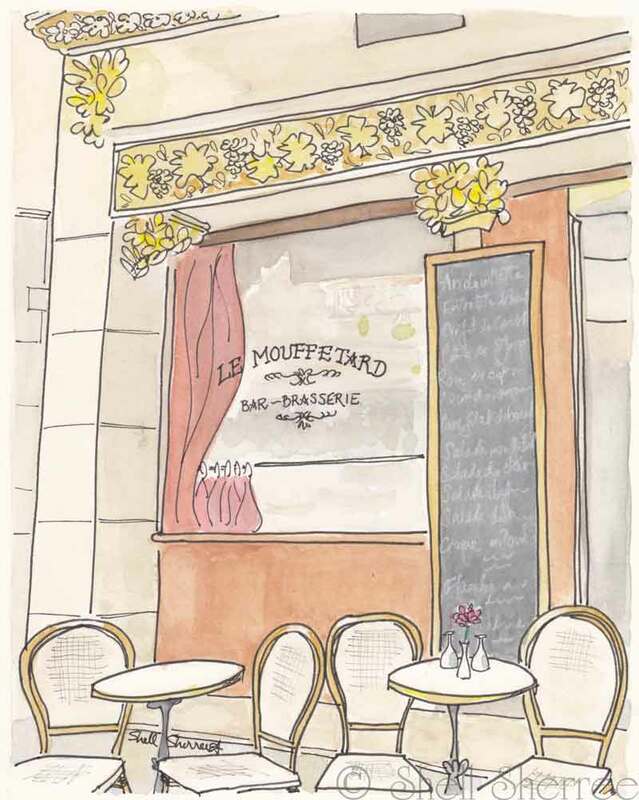 A rendezvous at Le Mouffetard is a wonderful idea! I've been fantasizing about a trip to France lately. 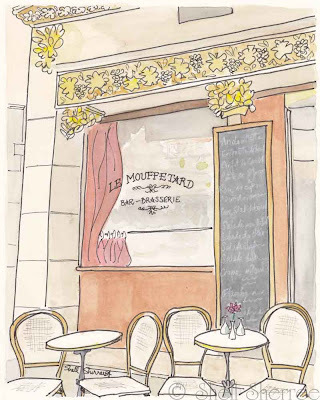 Francophile Friday is a delectable nibble! Hi Shell ~ Thanks so much for visiting my blog and leaving a comment. Margaret is such a sweetheart to send you my way. Such lovely inviting scene! I love all the soft yellows. Wouldn't it be wonderful if we could all be magically transported here to drink endless cups of café crème and eat macarons and soak up the sun and just gab the day away. This little café will be just perfect for our gathering and of course you will be the guest of honor, my dear... Thinking about you. I am running off to tell Virginia of this post... We have so missed you. Voila! I"m here and love, love this one sweet Shell. I walked right past this charming café just over a week ago. I brings me such pleasure to see your wonderful illos. Merci mille fois. Hi, Deb @ PaperTurtle, and thank you! Margaret is a sweetie-pie, isn't she. And it was indeed a pleasure to visit you. Looking forward to catching up again soon. Thanks, dear Genie!! I meant to email Virginia and let her know, so that's much appreciated. Virginia ~ oh, I'm delighted to hear you were right at this spot again on your last trip. Thank you as always for the beautiful inspiration! Margaret ~ I'm delighted on your behalf. And ever so pleased you brought Scout along! Thank goodness for sunshine ~ we've had some glorious days since things went belly up in the floods, and it's helped things tremendously. Your drawings are a never ending pleasure. I love your francophile Fridays. The lost goldfish story is such a great illustration of the great Aussie sense of humour. Thanks for sharing and keep up the good work! I'll stand! It's the least I can do to make room for everyone else, and I'll be able to turn gracefully this way and that to help myself to elegant little what-nots from both tables. Actually, now that I look more closely, where are the elegant little what-nots? Elastic pants and skirts have been my friends through many a long meal. If we sit around long enough chatting, I might need them at this delightful cafe too. Amy ~ you raise a good point ~ elastic skirts are welcome too, by any stretch of the imagination.